The tabs above contain all of the content required to complete the program assignments for ITSE 1330 unless otherwise specified in the assignment requirements. Given the abundance of valuable content available online, students are encouraged to also access the alternatives at the Resources tab. Follow procedures as outlined in the syllabus. Complete the Orientation Exam and Assignments by the due dates. See the syllabus for more information about course policies and procedures. The majority of modern computing solutions utilize a database to accomplish common computing tasks. A database is required for standard operations such as storing user data, presenting product information, supporting online store activities, inventory controls, etc. 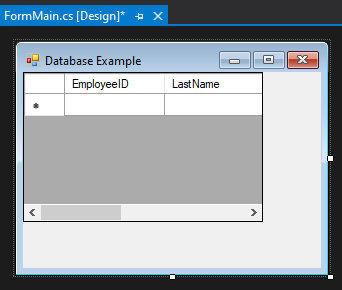 C# can connect to a variety of databases including the current dominant three: Oracle, MySQL, and SQL Server. Since C#, VS, and SQL Server are all Microsoft products, the most seamless and performant connections are offered via SQL Server. VS ships with a small SQL Server database engine identified as "Local" that makes it efficient to develop and test database applications from within VS without requiring additional installation, setup, and maintenance of database server software. Let's cover just a few database terms before implementing an application. It is important for all professional software developers to possess a working knowledge of database terminology and organization. The fundamental component of the database is the table. Tables contain rows and columns of data. Rows are also known as records. A sample record is enclosed by the red box. Columns are the vertical "cuts" of data and are also known as fields. In the table below, EmployeeID, LastName, FirstName, HireDate, and Country are columns in the table. An example column (FirstName) is enclosed in the blue box. The four most common code interactions with a database are create, read, update, and delete. Each of these operations is accomplished by queries (questions) issued to the database. The queries are submitted in the form of SQL (Structured Query Language) statements. The CREATE and INSERT statements are issued to create databases, create tables, and insert new data into tables. The SELECT statement is used to read from the database. The UPDATE and DELETE statements perform their respective operations. The window below shows the SELECT SQL statement (highlighted) that was automatically generated by a wizard. We will walk-through wizards in the sections below to produce the DatabaseExample application. You can see that the SELECT statement reads the field data from the Employees table which produced our example table above. Most databases in production applications today are known as RDBMS (Relational Database Management Systems). The "Relational" in RDBMS refers to the relationship between tables. When two tables together contain data required to answer the query, a relation is established between the two tables to facilitate the operation. Establishing a relation between tables is referred to as "joining" the the tables. The three main relation types are one-to-one (1:1), one-to-many (1:M), and many-to-many (N:M). The relation types are described in the table below. To establish relationships between tables, the tables contain what are known as a Primary Key (PK) and Foreign Key (FK). Tables typically have a parent:child association in which the parent table contains the "primary" portion of the data of interest and the child table contributes a bit less. For instance, in the 1:M relation described in the example above, there is a person table with relevant information about the person and a computer table with information about the types of computers the person owns. The person table would be considered the primary table and the computer table would be the child table. Both PKs and FKs consist of one or more field from their respective tables. By definition, the PK must be unique and cannot be NULL. The PK in a parent table is used to connect to the FK in the child table. For instance, the personID field could be a PK in the primary table and an FK in the child table. The personID field would establish the link (relation) between the two tables. The PK in the primary table supplies the link to the FK in the child table. The PK and FK fields are not required to have the same name however that is usually the case. The data types and content of the PK and FK fields must match. When a relationship has been established between tables using the PK and FK constraints, referential integrity will be enforced by the database. This means that a record in the parent table (the table with the PK) cannot be deleted from the parent table if a matching record in the child table (the table with the FK) exists. Doing so would produce an orphan record (a record in the child table with no related record in the parent table). The converse condition is another aspect of referential integrity. That is, a record cannot be inserted in the child table unless a related record (with the appropriate PK) exists in the parent table. These checks are supplied automatically by the database engine when a PK:FK relationship is established. The checks are important reasons for establishing the PK:FK link. 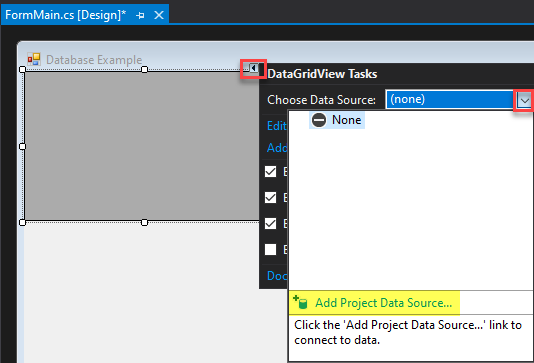 In this project, we take advantage of a powerful and flexible data control in VS called the DataGridView. With this control, we can quickly establish a pre-defined connection to a database and populate a table based on custom SQL specifications that we provide. All of this can be accomplish by responding to questions in one or two wizards. 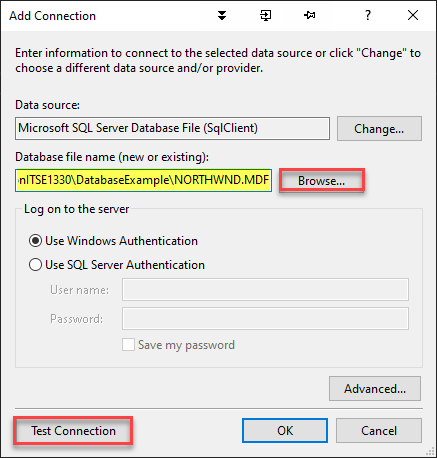 Let's get started by downloading the NORTHWND.MDF SQL Server database file from the Resources tab in Bb. Note that there is no "I" in the name. This is to avoid collisions with the Microsoft database named NORTHWIND that may currently be in use on your system. Create a new application named DatabaseExample. Rename Form1.cs to formMain.cs by R-clicking on the file in Solution Explorer | Rename and choosing to refactor. Change the form Text property to Database Example. Select Server Explorer on the View menu to open the Server Explorer window. Click the Connect to Database icon as shown. When that selection is made, VS guides the developer using a wizard to configure the connection. A wizard is a series of guided steps designed to simplify and improve a process. Now we want to select the source database that we will be using. 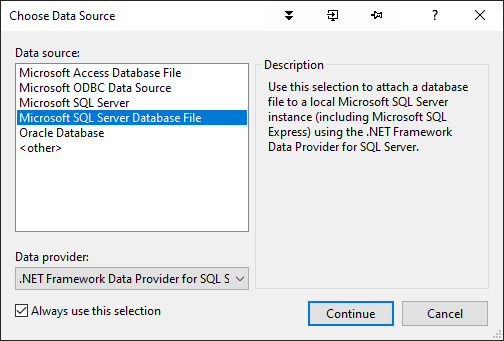 Select Microsoft SQL Server Database File and then Continue. 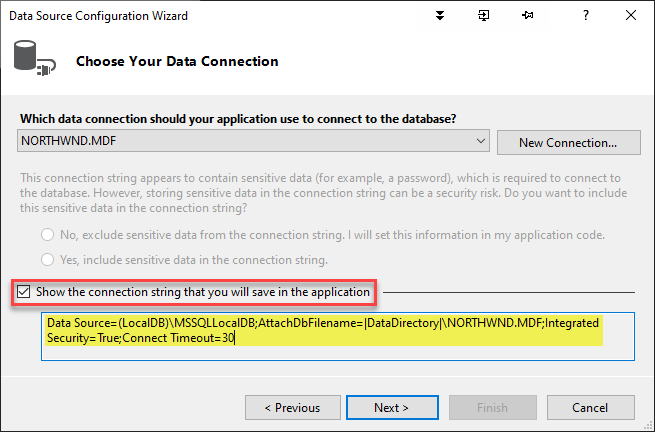 Choose Browse... in the Add Connection dialog and select the NORTHWND.MDF database file where you stored it. 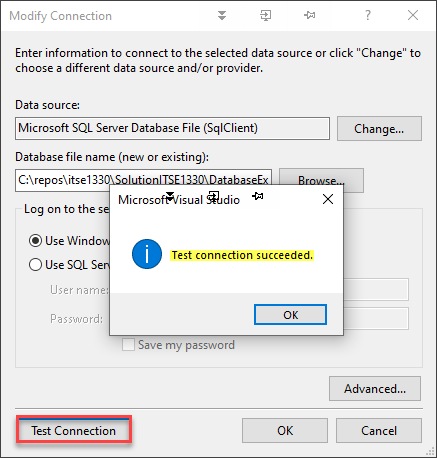 Select Test Connection to ensure you are able to connect to the database. In the Toolbox, double-click a DataGridView control to add it to the form. The DataGridView Tasks window initially appears. Click the icon in the red box to show that window at any time. Select the dropdown menu on the right (blue box) and then Add Project Data Source. 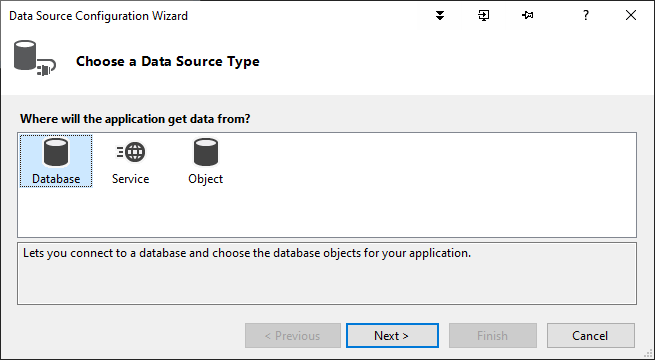 Like the connection above, configuring the DataGridView is simplified by a wizard. Select Database for source type and then Next. Select DataSet for the type of model. Since Database was chosen for the source type, Dataset is the only model option. Select Next. If we had not established the connection, we could select New Connection to do so now. Since we established a Data Connection above, NORTHWND.MDF should appear in the connection options. Note the highlighted connection string. This is used internally by the DataGridView to connect to the NORTHWND database. If we were connecting directly via code, we would use this Data Source connection string in our code to connect to the database. Select Next. 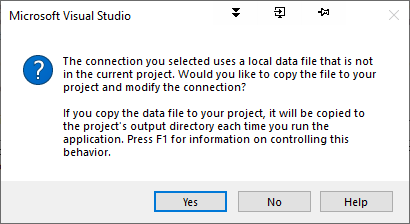 In the dialog below, Select Yes to copy the NORTHWND.MDF file from its original location to the project folder. Note that if Yes is selected the connection string from above will be updated to reflect the new location of the file. After selecting Yes in the dialog above, select Previous to view the modified connection string. Notice that it has been updated to reflect the new location of the database file. The DataDirectory is the top-level project directory. Select Next to save the connection string with the supplied name or change the name as you like. Select Next. 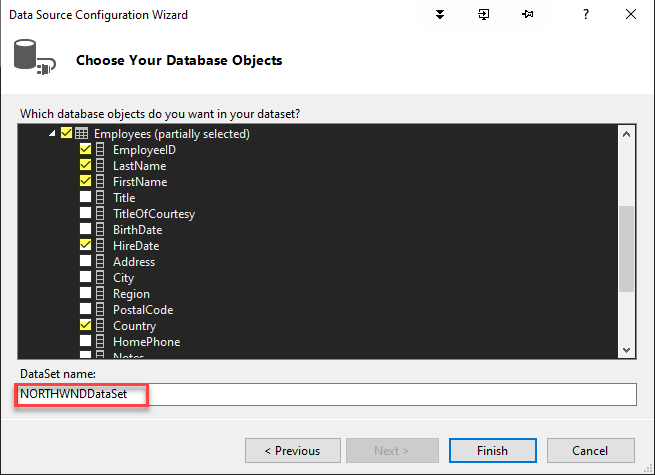 In the Choose Your Database Objects window, make the following selections: Tables | Employees | EmployeeID, LastName, FirstName, HireDate, Country. These are the columns from the database that will appear in our DataGridView control. Note that there are a number of columns in the Employees table and we are only selecting five to keep the DataGridView output simple. The default DataSet name is fine. Select Finish. Design view opens again as shown. Run the application to see the DataGridView in action. Notice the scroll bars. It would be nice to remove the horizontal scroll bar to offer a better presentation for the user when the application is running. 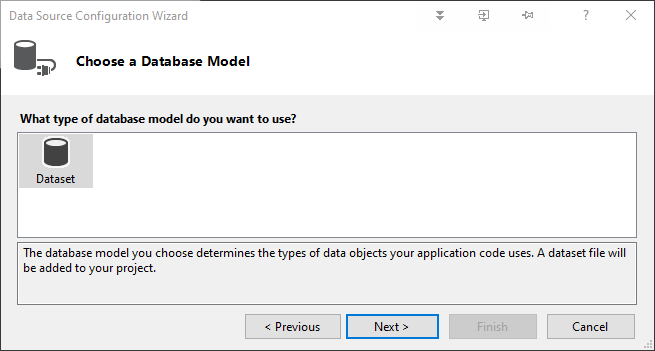 Make the following DataGridView property adjustments: AutoSizeColumnsMode- Fill, Dock-Top. Then set the formMain Size property to 600, 200. These settings should yield the view below. Now we have a custom view of the Employees table from the NORTHWND database. Using the DataGridView control, we are able to quickly present tabular data based on a queries constructed via wizards. Now we have a custom view of the Employees table from the NORTHWND database. Using the DataGridView control, we are able to quickly present tabular data based on a queries constructed via wizards. If we need to modify or add queries in the future, open the XML Schema Document (.xsd) file in Solution Explorer and R-click on the SQL tab as shown. 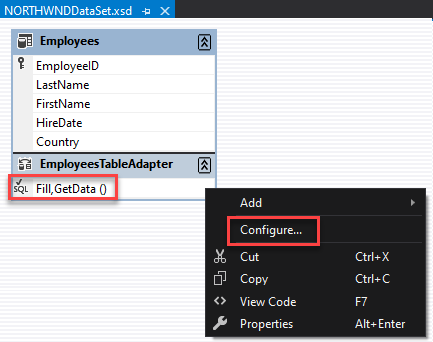 Select Configure... to modify an existing query or Add Query... to add a new one. The next page contains a list of C# resources. © 2019 R.L. Martinez, Ph.D.